We’ve been really busy for the last month working on some great new features. And today, we’re very excited to finally release some of those features. 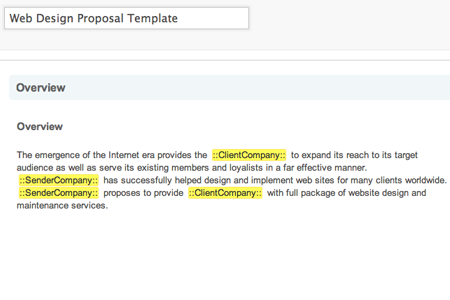 We always wanted to cover a full proposal workflow: from creating business proposals to signing them by clients online. 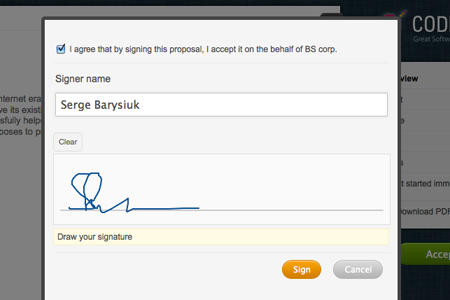 That is why we added an electronic signature support. Now your clients can sign proposals online. 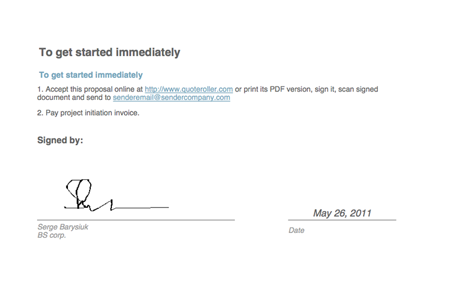 Drawn signature will be added to PDF document as well. Forget about fax, scanners, emails, printers, etc. 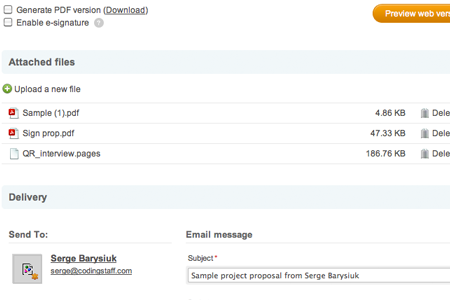 Use the Quote Roller to convert your online proposal into a signed document. We understand how important branding is, that’s why we added settings that let you brand your account. Upload your logo and add custom colors to match the Quote Roller with your corporate look and feel. Your clients will see the system branded with your identity. Quote Roller’s proposals now support tokens, or, so-called, data auto-injections. Now you can auto-insert client’s company name, project name, primary contact, project’s cost and many other items that we all had to manually type-in in previous versions. Tokens extremely reduce time needed to create a proposal out of a template. Quite often there might be a need to attach files when sending a proposal. Say, what if you need to add additional documentation, diagrams, designs, etc. We got it now! With a new upload feature it has never been easier. Never loose a deal. 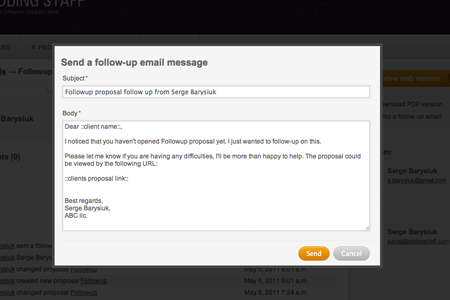 Send a follow up email to proposal’s recipient in one click and remind about yourself easily and quickly. 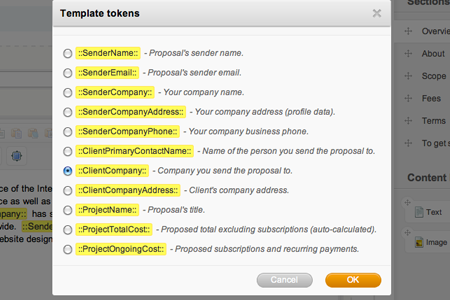 This was our oversight in the previous version, a user wasn’t able to edit a sent proposal. Thanks to your requests, we have added this option now. More then 98 bugs have been fixed, 28 new features have been added, we received a great feedback from our users (thank you!). Unfortunately it’s impossible to describe all features and improvements we added in this release in a short post, so we encourage you to sign up (or login) and check our proposal application yourself!